Canvas has become the most common support medium for oil painting, replacing wooden panels. One of the earliest surviving oils on canvas is a French Madonna with angels from around 1410 in the Gemäldegalerie, Berlin. However, panel painting remained more common until the 16th century in Italy and the 17th century in Northern Europe. Mantegna and Venetian artists were among those leading the change; Venetian sail canvas was readily available and regarded as the best quality. 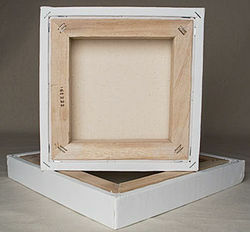 Canvas is typically stretched across a wooden frame called a stretcher, and may be coated with gesso before it is to be used; this is to prevent oil paint from coming into direct contact with the canvas fibres, which will eventually cause the canvas to decay. A traditional and flexible chalk gesso is composed of lead carbonate and linseed oil, applied over a rabbit skin glue ground; a variation using titanium white pigment and calcium carbonate is rather brittle and susceptible to cracking. As lead-based paint is poisonous, care has to be taken in using it. Various alternative and more flexible canvas primers are commercially available, the most popular being a synthetic latex paint composed of titanium dioxide and calcium carbonate, bound with a thermo-plastic emulsion. Many artists have painted onto unprimed canvas, such as Jackson Pollock, Kenneth Noland, Francis Bacon, Helen Frankenthaler, Dan Christensen, Larry Zox, Ronnie Landfield, Color Field painters, Lyrical Abstractionists and others. Early canvas was made of linen, sturdy brownish fabric of considerable strength. Linen is particularly suitable for the use of oil paint. In the early 20th century, cotton canvas, often referred to as "cotton duck", came into use. Linen is composed of higher quality material, and remains popular with many professional artists, especially those who work with oil paint. Cotton duck, which stretches more fully and has an even, mechanical weave, offers a more economical alternative. The advent of acrylic paint has greatly increased the popularity and use of cotton duck canvas. Linen and cotton derive from two entirely different plants, the flax plant and the cotton plant. Gesso-ed canvases on stretchers are also available. These pre-stretched, pre-primed canvases are suitable for all but the most exacting professional standards. They are available in a variety of weights: light-weight is about 4 oz (110 g). or 5 oz (140 g). ; medium-weight is about 7 oz (200 g). or 8 oz (230 g). ; heavy-weight is about 10 oz (280 g). or 12 oz (340 g). They are prepared with two or three coats of gesso and are ready for use straight away. Artists desiring greater control of their painting surface may add a coat or two of their preferred gesso. Professional artists who wish to work on canvas may prepare their own canvas in the traditional manner. One of the most outstanding differences between modern painting techniques and those of the Flemish and Dutch Masters is in the preparation of the canvas. "Modern" techniques take advantage of both the canvas texture as well as those of the paint itself. Renaissance masters took extreme measures to ensure that none of the texture of the canvas came through. This required a painstaking, months-long process of layering the raw canvas with (usually) lead-white paint, then polishing the surface, and then repeating. The final product had little resemblance to fabric, but instead had a glossy, enamel-like finish. This flat surface was crucial in attaining photographic realism. With a properly prepared canvas, the painter will find that each subsequent layer of color glides on in a "buttery" manner, and that with the proper consistency of application (fat over lean technique), a painting entirely devoid of brushstrokes can be achieved. A warm iron is applied over a piece of wet cotton to flatten the wrinkles. Canvas can also be printed on using offset or specialist digital printers to create canvas prints. This process of digital inkjet printing is popularly referred to as Giclée. After printing, the canvas can be wrapped around a stretcher and displayed. From the 13th century onward, canvas was used as a covering layer on Pavise shields. The canvas was applied to the wooden surface of the Pavise, covered with multiple layers of gesso and often richly painted in tempera technique. Finally, the surface was sealed with a transparent varnish. While the gessoed canvas was a perfect painting surface, the primary purpose of the canvas application may have been the strengthening of the wooden shield corpus in a manner not unlike to modern Glass-reinforced plastic. Splined canvases differ from traditional side-stapled canvas in that canvas is attached with a spline at the rear of the frame. This allows the artist to incorporate painted edges into the artwork itself without staples at the sides, and the artwork can be displayed without a frame. Splined canvas can be restretched by adjusting the spline. Stapled canvases stay stretched tighter over a longer period of time, but are more difficult to re-stretch when the need arises. Canvas boards are made of cardboard with canvas stretched over and glued to a cardboard backing, and sealed on the backside. The canvas is typically linen primed for a certain type of paint. They are primarily used by artists for quick studies. Wood-and-canvas canoes are made by fastening an external waterproofed canvas shell to a wooden hull formed with white cedar planks and ribs. These canoes evolved directly from birchbark construction. Maine was the location of the development of commercial wood-and-canvas canoes. E. H. Gerrish, of Bangor, is now recognized as the first person to produce wood-and-canvas canoes commercially, but other Maine builders soon followed, including, B. N. Morris, of Veazie, E. M. White, of Old Town, and, of course, the Gray family of the Old Town Canoe Co. 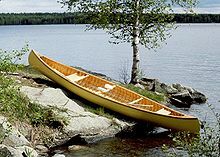 In the adjoining Canadian province of New Brunswick, from the late 19th century until being disbanded in 1979, the Chestnut Canoe Company, along with the Old Town Canoe Company in Maine, became the pre-eminent producers of wood-and-canvas canoes. American President Teddy Roosevelt purchased Chestnut canoes for a South American expedition. Wood-and-canvas canoes have undergone a resurgence in recent years, spurred in part by the Wooden Canoe Heritage Association. Builders abound, including Jerry Stelmok, Rollin Thurlow, Ken Solway, Joe Seliga, and many others. It has become popular to use the myriad of stretched canvasses sizes and shapes for unconventional creative expression. Artists can create miniature works on business card sized stretched canvas and use them as trading cards to make connections with other artists. Many artists use canvas for altered art pieces as well as for scrapbook pages—because stretched canvas is available in many sizes, from miniatures to wall size, it is used for decoupage and needlework projects, made into lamps, or painted simply for home decor. We're adding new products all the time. Please check this page again soon.